Sierra Music is happy to be affiliated with Dan Haerle, noted composer/arranger, educator (University of North Texas) and pianist. 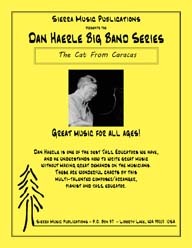 Dan Haerle has created a very nice, very hip latin chart with a great melody. Dan Haerle has created a very nice, very hip shuffle / funk chart with a great melody. Dan has created a wonderful Rock Ballad, with a nifty, repeating vamp figure, that can be played by even the most inexperienced players. This is a great drum set feature, but it also has room for solos for Tenor Sax, Trumpet and Guitar (or Piano). Big Band Gospel.